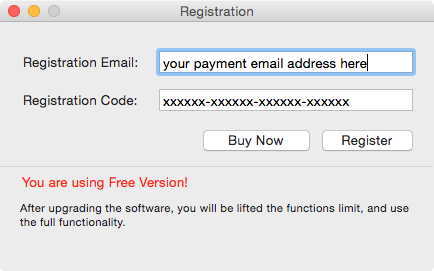 When you purchased Star (pdf) Watermark for Mac, you will receive an email including registration name and code in your payment email inbox or spam folder. Find out them first. Did not receive register code? please send mail to [email protected], we will send it to you ASAP. If you got this error message, please download from menu "Free Download" to try again. Launch the program and find "Register" menu item in upper left corner of the computer screen as below. Type your register name (your payment email address) and code, and click "Register" button to register the program. (2) You are using correct edition you bought, maybe you bought Pro version, but you are using Ultimate version. 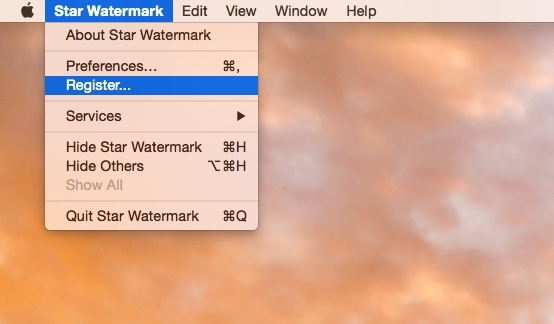 (3) Maybe you bought Star PDF Watermark (for pdf files), but you are using Star Watermark (for photos). (4) The registration name is your payment email address. (5) Typed less or more character in register name or code. To avoid a register issue, the best approach is to download and install from the download link in your payment email inbox you received.